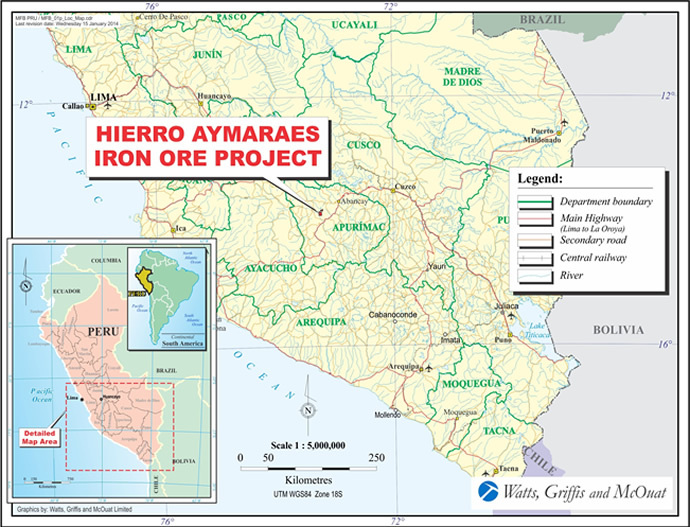 The Aymaraes Iron Ore Project is comprised of five mineral concessions totaling 5,700 ha in Peru. The Aymaraes Project is the focus of much of Ferrobamba’s recent exploration work: geophysical surveys, geological mapping, surface sampling and drilling. A number of outcrop areas largely comprised of magnetite have been identified on these properties. Comprehensive property information is detailed in a NI 43-101 compliant Technical Report prepared by WGM, dated 19 August 2013 and a geophysical report prepared by PGW, July 2013. A positive Conceptual Study by BBA on the Aymaraes Iron Ore Project, dated 24 October 2013, assessed the economic viability of building and operating an independent stand-alone mine.